Passion. Someone once said to me “I’ve been trying to put my finger on it when people ask me to describe you. And the word that comes to mind is passion.” And so we will credit that very ‘passion’ with turning the discovery of National Watermelon Day into a full out watermelon event at work today. I have the pleasure of working with the greatest group of people. Over the years we have learned how to work hard while incorporating play into our days. Today we played with watermelon. That oh so lovely fruit, no wait vegetable, was the featured ingredient on our buffet. 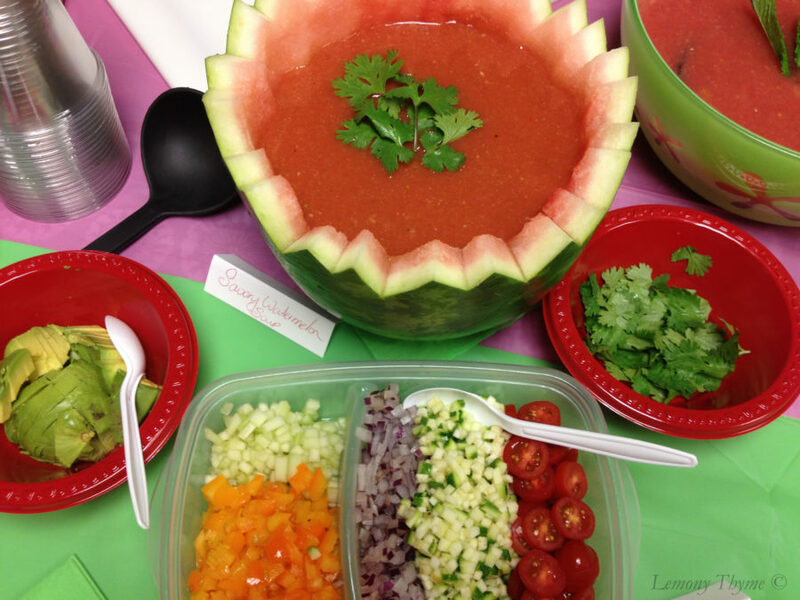 We had Watermelon Black Bean and Corn Salsa, Watermelon Caprese Salad, Watermelon Infused Lemonade, Watermelon Cookies & Cupcakes, our mascot Turtlicious (hand carved by one of my many creative teammates), Watermelon Gazpacho & Tropical Watermelon Soup with Peach Purée. One large seedless watermelon (not huge) yielded enough watermelon flesh to make two soups and 1 1/2 quarts of watermelon water for the lemonade infusion. The Watermelon Gazpacho was savory and so fresh. The layers of flavors kept us coming back for more. This soup could have easily been served in a glass and called a smoothie. It was cool, sweet and very refreshing. Combine the followng in a blender: flesh of one mango, 2 cups pineapple chunks, 6 strawberries, and enough watermelon purée to blend. Once smooth combine blender contents with 6 cups watermelon purée and 2 Tbl. of honey or agave nectar. Chill completely. Blend 2 sweet Georgia peaches until smooth, then strain through a medium mesh sieve. I’d say we could be described as a passionate bunch. Ah Watermelon, who knew you could be so much fun. Oh my God!!!! Awesome!!!! I can’t believe it. I’ve read about your longest night celebrations. I hope you’ll be able to include some of our recipes and that they bring you good health and well being in the coming year. Please feel free to share our recipes with your group. Many thanks. I wonder if I could have the recipe of watermelon cookies and cup cake. Fortunately for us, there’s a “National” something day….every day. Oh the possibilities!! What a wonderful idea this was, and wonderful watermelon dishes provided by all. I have to admit, I had never heard of watermelon soups, but they were both delightful.